I own a 1969 sportroof Mustang w/a big 6 cylinder 250 cid, 60,000 miles act a/c, accent pkg, hood scoop 5 lug wheels, a C4 transmission, power steering and a a base interior. It has a 3:00 gear 8" Ford differential. Ive taken it to some smaller shows and different people tell me they only made less than 100 of the "E" versions. Purchased in Treasure Island Florida. Was told they were zone built, ie. Georgia, Florida. I love that car it get looks everywhere I take it. I want to know what you know about my baby. The balance of the VIN is the production number. I'm going to have to take your info and change it a bit. The body code should be either a 63A or a 63B, but based on what you said, it is a 63A, or sportsroof with a standard bucket interior. The color code "M" says you have a Wimbledon White car. and the trim 2B means it has Blue, Standard Buckets. Without the other information from your data plate, I can only make a quesstimate.. If your car was delivered in Florida, the DSO would have been # 24 or Jacksonville. The axle ratio code for the standard 3.0:1 differential would be a 6, (however see my note below). So what does the "E" mean ? The Mustang E was for economy. It was a fairly small production run of sportsroof cars, equipped with an inline six, an "economy" gear ratio (2.33:1)wich was a Code "F", a special torque converter and included a special "E" insignia, replacing the usual quarter panel logo. Note: I'm not quite sure how you got a 3.0:1 axle, unless the original one was replaced. It was not available with air conditioning, as this was a fuel economy sapping accessory. This was a one year only option and was not particularly popular at the time, hence the single year production. Estimates seem to range between 50-100 units produced this way. 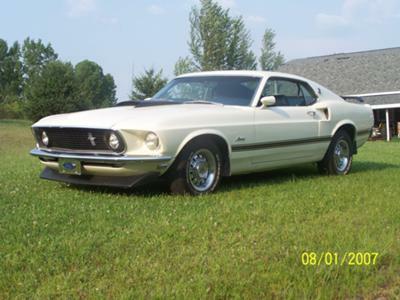 Your car seems to have some later added on parts, including a hood scoop, front air dam and rear spoiler along with the side stripe like the 1969 Mustang Mach 1. You do have a real rare pony! You Have A Very Rare Mustang ! The 1969 Mustang "E" was a limited edition sportsroof with the 250 cubic inch 6 cylinder and a "highway" rear axle ratio of only 2.33:1. Yours is only one of 50 sold. If you would like to send some pics via the "Contact Me" section, I will see what we can do about getting your car into the 1969 Mustang section. I also have a 69 mustang E Just got my Marti report back verifying it. Do you have the "E" decal on the rear quarters. I am looking for pictures of that. I hope that this is not so old that no one monitors this anymore. email me at tgwise@yahoo.com I also started a facebook page look for ford mustang-e on facebook and comment.